Sway, the latest collaboration between ustwo and Danish mental health company PauseAble, is now available to download for iOS. Practising mindfulness for 20 minutes per day can significantly enhance attention levels and help mood regulation. Sway is a brand new interactive meditation experience designed to help people improve their attention and gain focus. After conducting research using PAUSE, our first interactive meditation app, we wanted to create a tool to subtly integrate mindfulness practice into daily situations. At ustwo we want to launch products that have a meaningful impact in the world – Digital Health offers us a platform to do this. Within this space, there is a unique opportunity to transform people’s daily lives. We believe that by convening true partnerships between digital health innovators and healthcare experts, we can design and develop relevant healthcare solutions with people’s actual needs in mind. Similar to PAUSE, our first collaboration with Pausable, Sway uses your phone to sense interactions and provides calming feedback to help you sustain your movement for a longer period of time. For Sway, we have opened up the interactive component to involve the whole body while PAUSE focused on touch and screen interaction. Using your phone’s motion sensors, we are able to track slow, continuous bodily movements and provide feedback as long as the movement is in motion. From simply moving your phone in your hand while sitting down or lying in bed, or putting it in your pocket or handbag and gently sway your body while waiting for the bus or even taking a mindful walk. For Sway we designed six unique levels to help users learn new techniques to be mindful in everyday life and subtly practise mindfulness anytime and anywhere. The levels are also a simple training program to slowly progress and reach the goal of practising mindfulness for 20 minutes per day. The feedback in Sway is vital. It helps users give meaning to the movements and sustain them for a longer time. In Sway we have put a lot of focus on the audio as the main form of feedback to allow users to be mindful in public and busy environments without interacting with the screen. 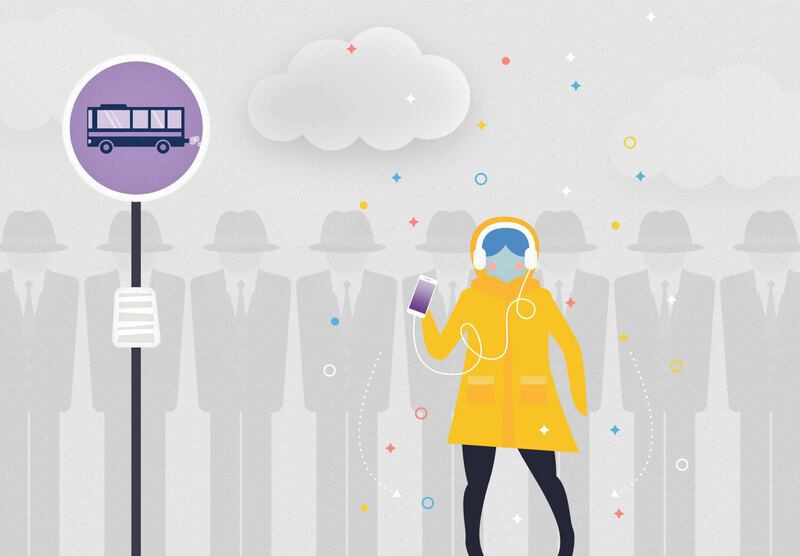 For example users can put their phone in a pocket or handbag and gently sway their body while waiting for the bus or even taking a mindful walk. We designed Sway by initially envisioning a journey the user would take on the path to clarity. As such, our main challenge was to build an experience that was calming while at the same time interesting enough for users to feel they were progressing. Our solution was to build a generative landscape, which allowed users to move through space as they would their own consciousness. It provided them with the ability to focus on a calming environment free from distraction, yet one which was still interesting, varied, and unique. The generative sound was also instrumental in creating this sense of calm progression. Each level has a distinct type of sound, yet not two Sway sessions have the exact same sounds. We could control the overall feel of the experience while allowing the individual melodies, sounds, and effects to play on their own. The device plays each sound independently and interweaves them together to produce a controlled yet dynamic soundscape. 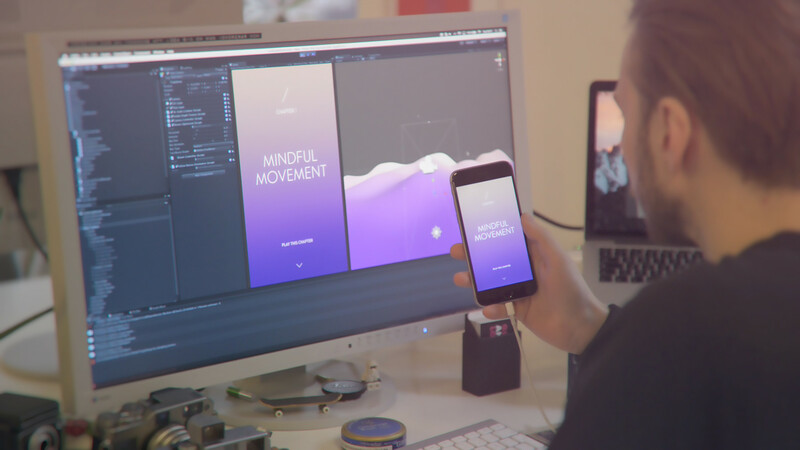 Sway combines the generative audio and visuals to create a unique experience where the user can explore a soothing and ever changing environment through the art of meditation. Sway is based on the new scientific approach to mental wellbeing called interactive meditation. 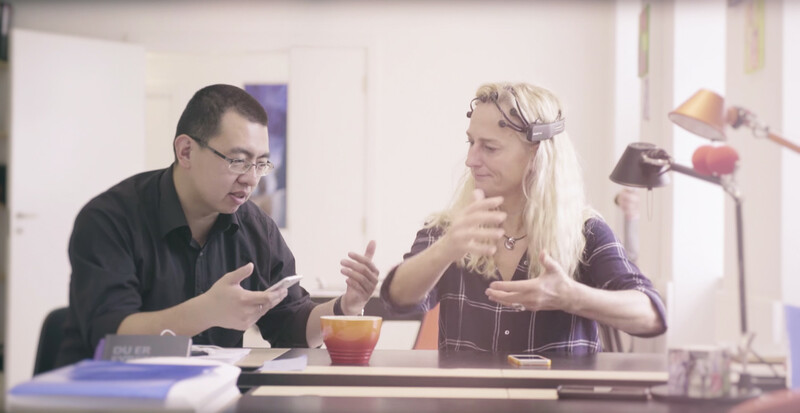 Based on the ancient learnings of Tai Chi and mindfulness, interactive meditation uses a patented ‘attention feedback loop’ and interactive technology to detect human voluntary attention through slow, continuous and gentle movement. It has been scientifically validated to provide similar results to existing forms of modern meditation such as ‘guided meditation’, but has been proven to work better in active and noisy environments. – making it easier to practice in our busy lives. To dive deeper into interactive meditation, please read Introducing Interactive Meditation by Peng Cheng, our partner and founder of PauseAble.